Reconnective Healing is a new life changing form of healing that brings you to physical, emotional, mental, and spiritual balance. You will see rapid improvement in your life in all ways, as you transform on a core level. Reconnective Healing reconnects you to the fullness of your being and who you truly are. Every health challenge is a combination of the physical, mental, spiritual, and emotional. We may simplify it according to its main characteristic. Reconnective Healing doesn’t specifically “treat” anything, but allows us to return to balance on all levels. What is the Nature of Reconnective Healing? Reconnective Healing facilitates rapid, permanent change that continues to work for you for the rest of your life. It is not restricted to a single illness or health problem. Reconnective healing is a new and very powerful high frequency energy that carries light and information from a “field” of spiritual healing energy. Reconnective Healing works very deeply at a quantum inter-dimensional level to facilitate balance and healing of body, emotion, and spirit. It facilitates the reconnection of your current being with your energetic template as it was perfectly designed. Reconnective Healing works directly with the core electromagnetic connections of the body and being at all levels. Besides being a very high frequency vibration, it is extremely expansive. It goes directly to the core origin of issues (root causes) and imbalances. It works rapidly and generally requires 1-3 sessions for a healing sequence, although additional sessions may be necessary. Once the core origin is transformed, everything else connected to this issue tends to shift into realignment more quickly. Rapid results manifest, and the healing unfolds long term as is appropriate to your life path. The healing is grounding and expansive. Reconnective Healing is here on the planet for the very first time. It uses new frequencies to allow for the healing of body, mind, and spirit. It is beyond Energy Healing, incorporating energy, light, and information. Our DNA responds to these powerful frequencies making the healings permanent. It is different from any technique we have ever encountered before. A practitioner does not “send” the energy, as in other energy healing, but “senses” it, becoming a catalyst for a healing to take place. Reconnective Healing provides life-enhancing benefits for all life. These almost tangible energies are initiated at the beginning of a session and continue to work with one long after the session has ended. We are forever changed after a session, operating at, and attuned to a higher frequency than ever before. These frequencies can shift us to a higher level of consciousness and a higher level of being. What Would I Expect at a Reconnective Healing Session? During the session, you will be asked to lie down, fully clothed but with shoes off, on a massage table, close your eyes, and “let go”. It is best to be in a state of expectancy and to allow whatever is supposed to happen. It is not necessary, indeed not recommended, that you meditate, pray, or be attached to any specific outcome. Be receptive to the Reconnective Healing experience, knowing that you are participating in a positive and exciting process, brought to you from God/Love/the Universe/Universal Consciousness and intended to give you exactly what you may need at this time. Just notice what you notice and notice what you do not notice. Each person’s reconnective healing experience will be unique and the healing frequencies will work on each person in a unique way at whatever level they require whether they are consciously aware of it or not. The sessions last about 30 minutes. After a reconnective healing session there will be time to ask questions and give feedback on what you experienced. If you are interested in experiencing either The Reconnection or Reconnective Healing, contact Karuna Joy (Pat Chen). 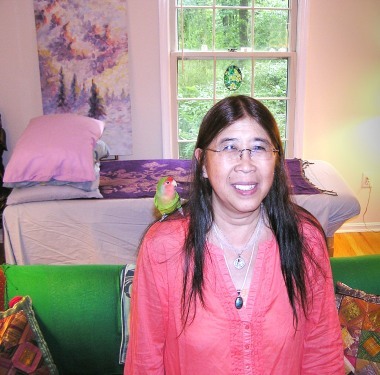 Karuna has clients in Northern Virginia and the Greater Washington DC area, as well as worldwide through distance-healing and phone sessions.